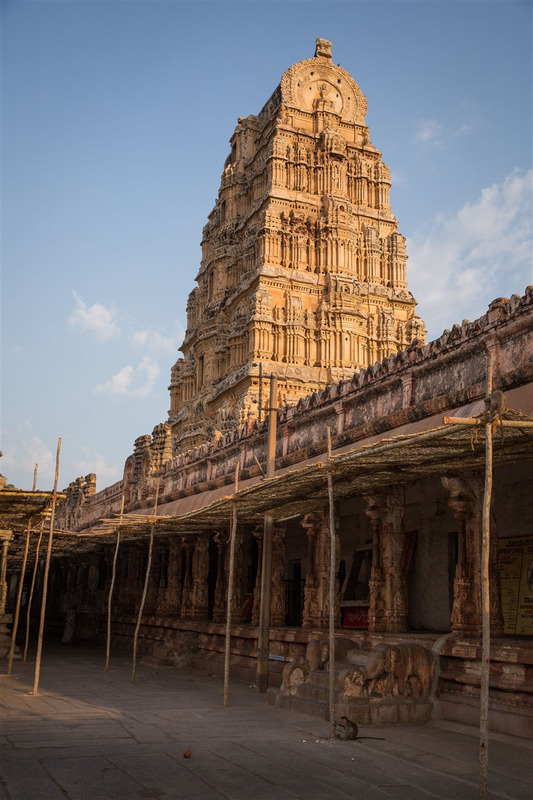 Thought to date back to the 7th century and attracting large numbers of Hindu pilgrims, the Virupaksha Temple is likely to be your starting point for any exploration of Hampi. 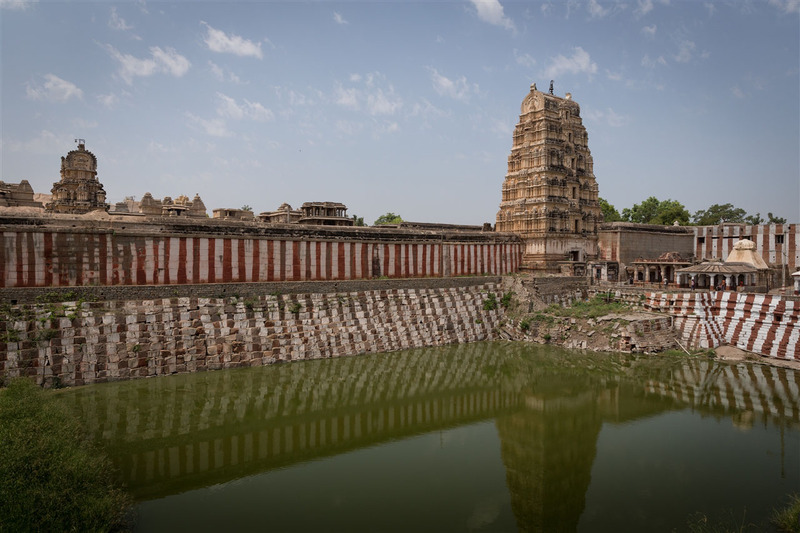 It’s a good choice too, I found Hampi a little disorientating at first as the city is so large and the monuments dispersed, so you need a point of reference and the temple complex is just that. 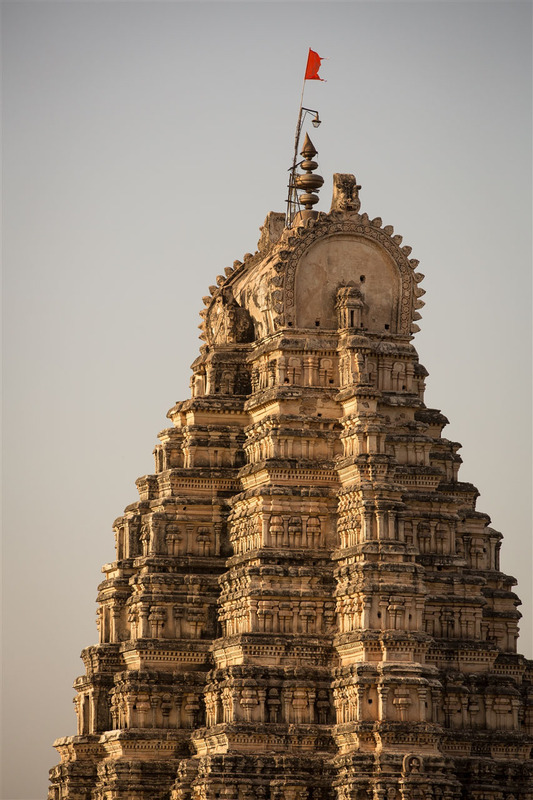 Although set in a valley right by the Tunghabhadra river, the vast 50m tall gopura (entrance tower) dominates the landscape, and acts as a bit of a magnet for both the eye and the camera. 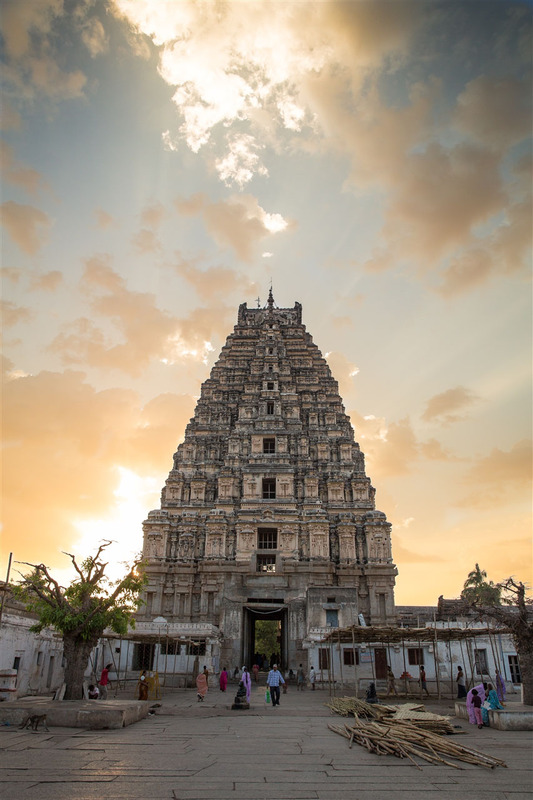 For those interested in travel photography, the Virupaksha Temple is likely to feature highly in any sunset shots you try to capture. 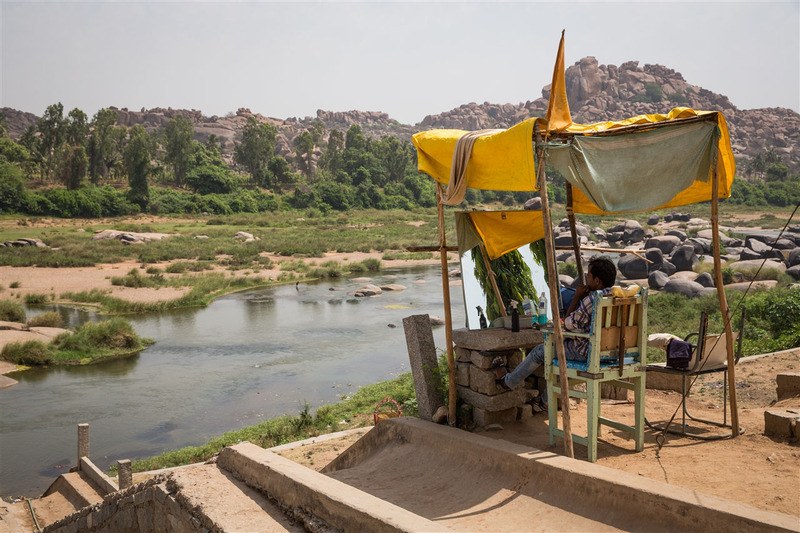 I’ll be covering the best photo locations for that in later blogs on Hampi. 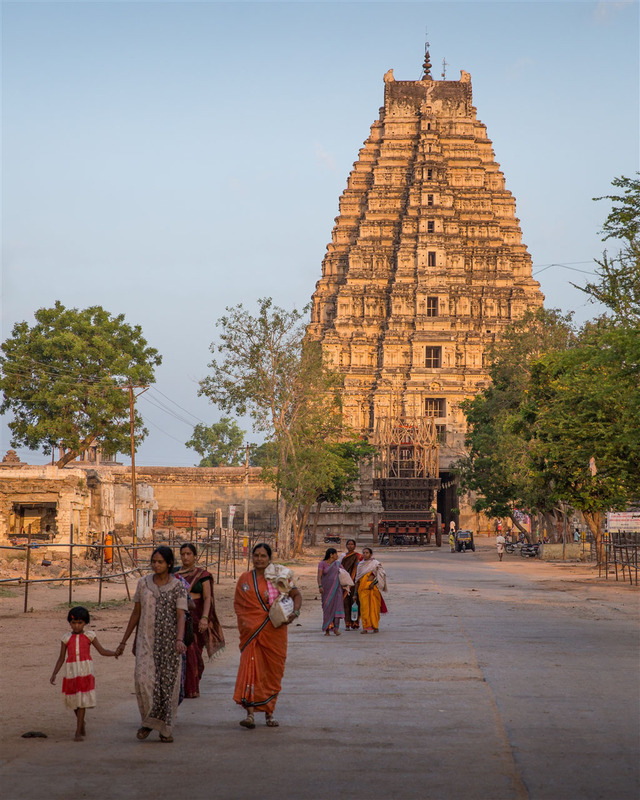 In front of the main gopuram is Hampi Bazaar, a 1km long street flanked by single and double storey ruined pavillions that date back to the 16th and 17th century. 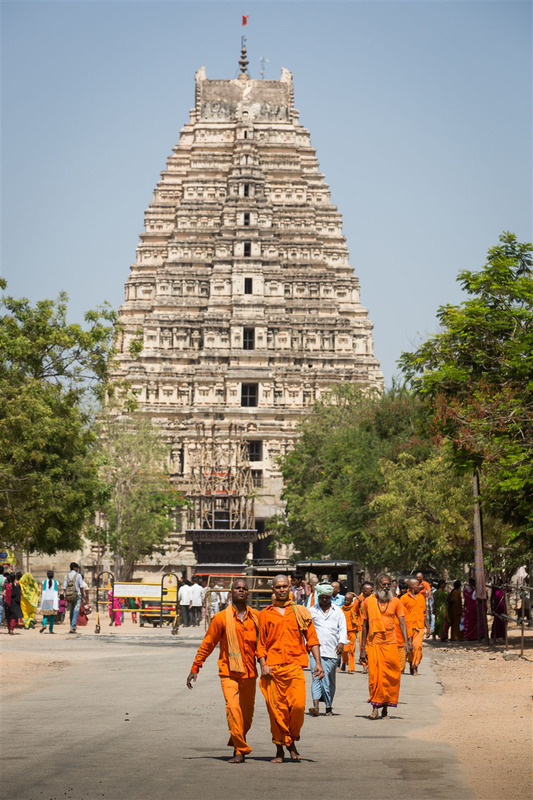 The street in front of the temple is wide enough for a chariot to travel during the annual festival that celebrates the marriage of Pampa and Shiva. The bazaar is a good place to stop and watch the world go by, it’s quite a busy thoroughfare for both visitors and locals alike, there’s always something going on. 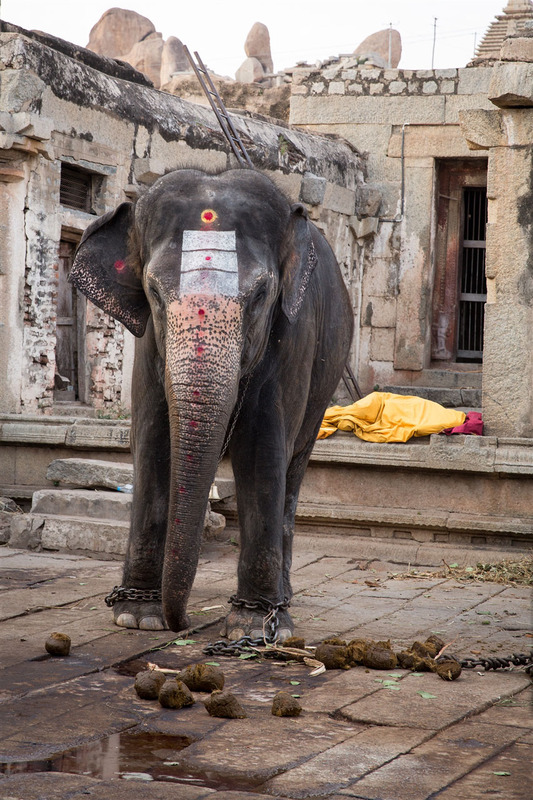 The Temple itself originally had a few Shiva shrines on which the present structures were built, which means this is one of the oldest living temples in India. 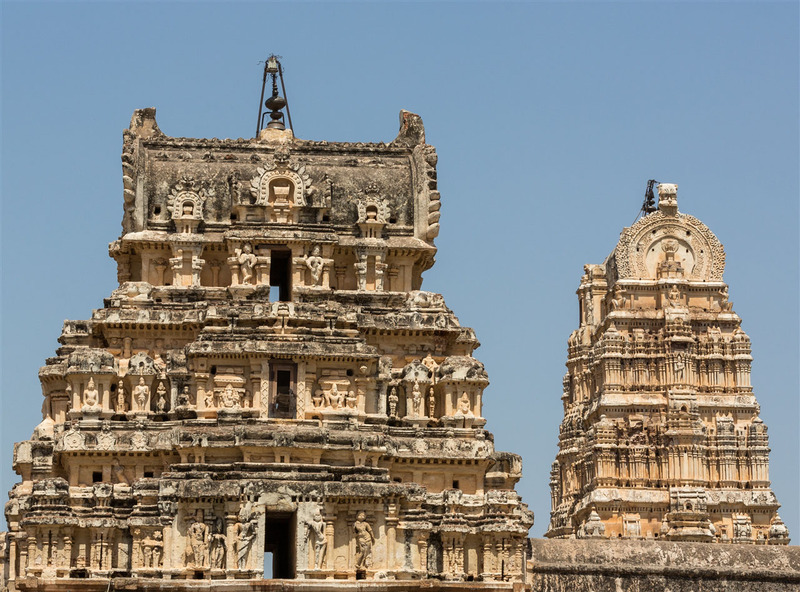 In the centre is an ornate temple hall built by Krishnadeva Raya in 1510 to celebrate his coronation. 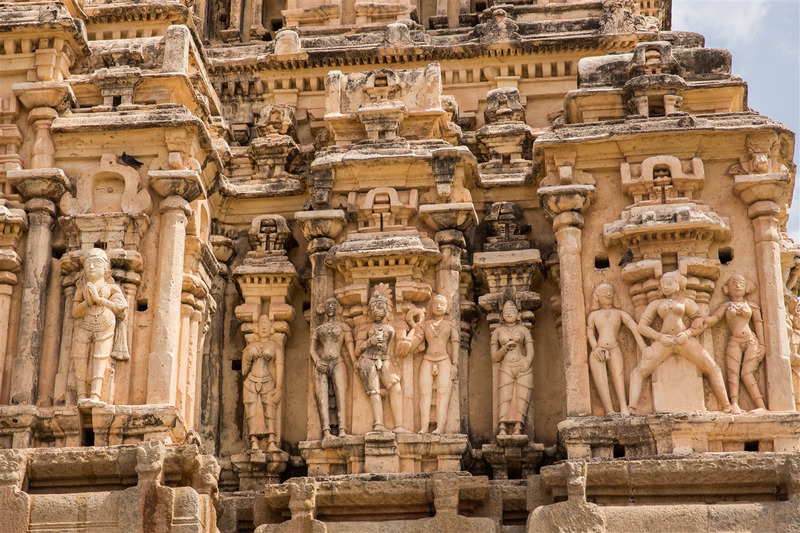 Both the north and east gateways are beautifully carved on all tiers, and there are many more smaller shrines to explore within the complex. 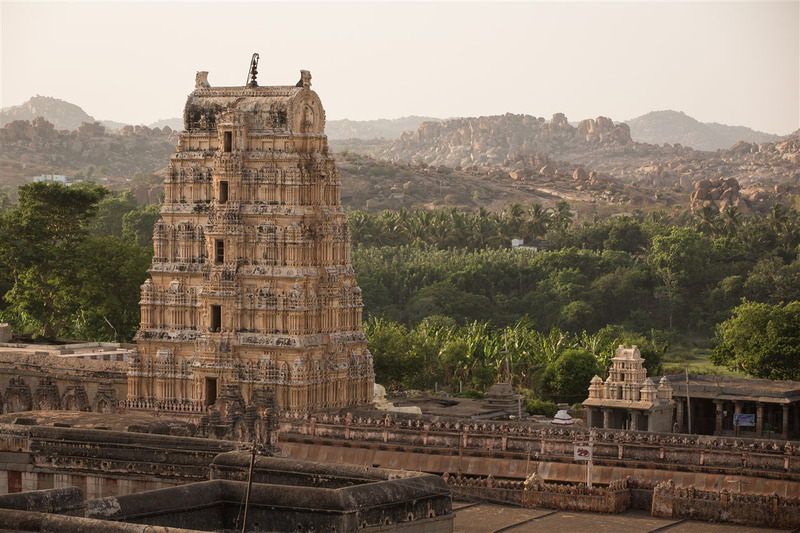 The Virupaksha Temple at Hampi is open daily from dawn to dusk, but closed 1pm – 2.30pm. I would recommend getting there early leaving the rest of the day for sightseeing further out. 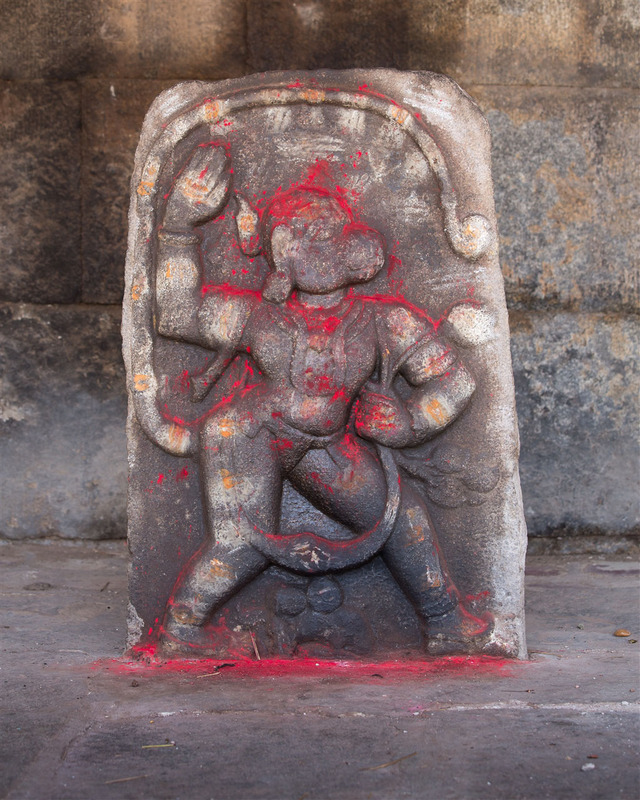 I decided to head south to see Hemakuta Hill and beyond, which will be where the next blog post guides us. 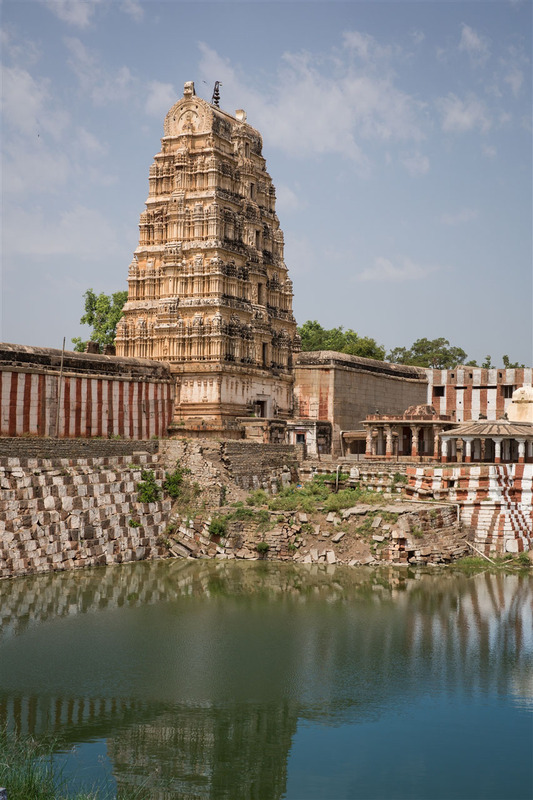 Amazingly beautiful temple and photographs! You are so talented. The temple as an orientation marker reminds me of days wandering in Florence…if I lost my way, I could always reorient myself by looking up at Il Duomo. Thank you for the kind words, it helps to photograph subject matter like this ! 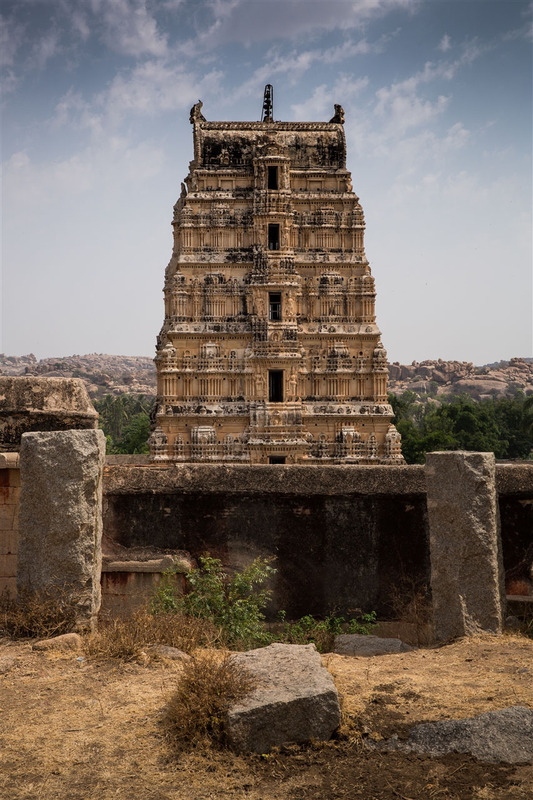 In fairness a lot of Hampi is out of sight of this temple, but for the first day when you’re getting your bearings it’s there as a solid signpost. But this temple is just the start, there’s a lot more to come ! Bardzo piękne widoki, jak ktoś nie ma jak podróżować to przynajmniej tyle zobaczy. I think this is one of the historic relic that needs to be in protect , very beautiful and worth the high art. Thank you for the fascinating photographs and the explanation.